The properties that became 10A, 12 and 14 Chapel Street in Thornbury had a shared history. 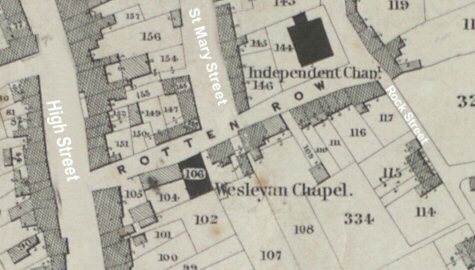 They occupied a plot of land that is shown as number 116 on the Tithe Survey map of 1840 shown here on the left. The houses that we have called 10A and 12 Chapel Street have given us many problems. It is very difficult to be sure who was living in this property. We are able only to make a “best guess” about their early occupants and which of the two houses they lived in. The numbering is unusual and we only know it applies to these two house because in 1958 the then owner Bertha Annie Winter sold number 14 and two other properties which are called 10A and 12. We do not know how the property was divided between 10a and 12 or what the houses looked like, nor do we know why 10A was given this number and not 12 or 12A. We would be most grateful for any description, further details or photographs to help us give a more detailed history of this part of Chapel Street. William Lippiatt. The 1841 census shows that William Lippiatt lived in this property in Chapel Street. He was a tailor aged about 55 years. He lived with his wife Elizabeth and their children; Alethea aged 20, Charles aged 13 Robert 11 Frederick aged nine and Tom aged four. In this census Thomas Mills a mason aged 19 appeared to lodge with William Lippiatt. By 1845 Thomas Mills, then a journeyman mason was living in 17 Horse Shoe Lane when the owner of the house, Mary Wilkes, made her will. Click here to read more about William Lippiatt. William Riddiford. By the census of 1851 William Riddiford aged 30 and an agricultural labourer lived in what we believe to be 10A Chapel Street with his wife Louisa aged 25. They had two lodgers; John Collins a widower who was an agricultural labourer aged 45 and James Collins aged eight. William was the son of Maria Riddiford. He was born in 1819, but not baptised until 18th June 1827 when he was baptised as ‘William Longman’ because his mother had married William Longman on 23rd November 1825. Although baptised under the name of Longman, he was recorded as being ‘Riddiford’ on his marriage certificate, in the 1851, 1861 and 1871 census records, various rate books and on his burial record. William married Louisa Landfear the daughter of Nicholas and Mary Landfear on 12th February 1844. This was on the same day that Louisa’s sister Mary Ann married William Voice. William and Louisa Riddiford must have moved into Chapel Street soon after their marriage and they continued to live there for some time. The 1851 census shows two children a son George, who was baptised in Thornbury on 25th April 1847 and Mary Ann baptised on 3rd February 1850 and only one year old in the census. When Walter was baptised on 27th February 1853, there is a note that the “abode” (presumably of the family) was Bristol. We cannot account for this as the family appeared to live in the same house in 1861. The “abode” was certainly Thornbury when Emma was baptised on 6th December 1855. We were confused that the 1861 census showed a son, Frederic was aged four years, as we could find no record of his baptism. We are grateful to Len Dewes for pointing out that he was baptised as Frederick Longman on 1st November 1857. His birth was however registered as Frederick Riddiford in the Thornbury district in 1857. William continued to be an agricultural labourer. By the 1871 census William aged 51 and Louisa his wife aged 48 not only had their son Frederick then aged 13 a scholar living with them and but they also had two more children; Alice aged five and Ann Maria aged three. Alice was baptised in Thornbury on August 5th 1866 and Ann Maria on June 6th 1869. In 1871 they had a lodger called Henry Simmonds aged 20 who was a railway clerk. The lodger is interesting as although Chapel Street was indeed near the railway line when it was built, it was not opened to the public until September 1872. Perhaps Henry Simmonds was involved with the employment of the men who built the railway and was a wages clerk or something of the sort. The rate book of 1876 confirms that James Martin owned three properties in Chapel Street and that William Riddiford lived in one of them (John Beale being in the house we describe as 14 and William Bendall in what we have called 12A). William Riddiford’s name also appears in the 1880 rate book. However his name is struck through. This is because William Riddiford died in August 1877 aged 58 and the house was actually occupied by his wife Louisa. We understand from Len Dewes that William had been admitted to Wotton Asylum under the name of ‘Longman’ and he died there. He was buried in Thornbury under the name of ‘Riddiford’. Louisa Riddiford married Henry Rice in Bristol in the December quarter of 1879. Henry was from Sherston in Wiltshire. Henry Rice. The census of 1881 shows Henry Rice was living in the house that later became 10A Chapel Street. He was a married man aged 55 and a plasterer from Sherston in Wiltshire. Louisa his wife appears to be visiting the home of her married daughter, Mary Shell in Brynminin, Glamorgan. Louisa was described as a laundress. Henry was living in Chapel Street with his daughter Rosa who was aged 25 and unmarried. Rosa also from Sherston had a daughter as Henry’s granddaughter Elizabeth aged one month was living in the household and she was born in Thornbury. The records of St Mary’s Church in Thornbury confirm that Elizabeth Rice was baptised on 24th March 1881 and that her mother was “Rose”. Elizabeth died aged eight months and was buried in Thornbury on 2nd November 1881. Henry and Louisa Rice had moved to London by 1885 as they do not appear in the rate book of that year. The 1891 census shows Louisa Rice in London aged 62 and born in Thornbury. She was living with Henry Rice from Sherston in Wiltshire and a daughter Alice Riddiford aged 24 from Thornbury. They also appeared to have a son William Riddiford aged 10 months in London. In view of Louisa’s age perhaps the son was more likely to be the son of Alice Riddiford. Mrs Stephens. She lived here in 1887. We believe that this was Elizabeth Stephens the wife of Thomas Stephens. By 1890 Elizabeth moved to 14 Chapel Street. Hester Phillips. In the rate book of 1890 Hester Phillips lived in this house. By 1891 she had moved to 5 Rock Street. Mark Rugman. In the 1894 poor rate book it says that “Mark” Rugman lived in a house owned by James Martin. The 1891 census shows that the house was occupied by John Rugman a married man aged 31 and Ellen his wife aged 27. They lived in two rooms with a son Jesse aged aged five and a stepson Walter Hunt aged seven. We cannot account for the difference in the names of the tenants but it does seem possible that both Mark and John Rugman lived here. Mark Rugman the son of a labourer William Rugman married Annie Hunt the daughter of Meshack Hunt in 1891. John Rugman the son of Morris and Sarah Rugman, may have been a cousin of Mark. In 1886 John had married another daughter of Meshack Hunt called Ellen. Thus the two men were brothers in law by 1894 and the families may have been living together or John may have taken over the tenancy from Mark. By 1899 the family had moved to 4 Rock Street. Harriet Phelps. The rate book of 1900 shows that Harriet Phelps lived in what we believe to be 10A Chapel Street. Harriet was born Harriet Day and was the daughter of John and Emma Day of Oldbury. She was baptised 24th October 1841. She married Charles Phelps in Thornbury in 1867. In the 1891 census she had been a tailoress living in Cheltenham. Her husband Charles, then a groom aged 42 who was living with her at that time was born in Morton. The 1901 census shows Harriet Phelps aged 59 lived in three rooms in the house in Chapel Street. Although she was described as a wife she was living alone. She was from Oldbury. In 1902 and 1910 Harriet was in receipt of charity from the Mayor’s fund. Please click here to read more about this charity. The 1911 census described Harriet Phelps aged 69 as a widow. She was a dressmaker. We have not been able to trace the death of Charles Phelps. Harriet died in Thornbury aged 72. She was buried in Thornbury Cemetery on 8th October 1914. ‘Mrs Phelps’ was still being listed in the 1915 Prewett’s Directory but we assume that this information was a little out of date. A. Till – the 1916 Prewett’s directory shows that ‘A. Till’ had replaced Mrs Mundy as the occupant of this house. We don’t know who lived in the house for long periods of the 1900s. We would like to hear from anyone who can give us any information. G Collins. In 1925 and 1926 the name ‘G Collins’ appears in the rate books for tenants of Annie Exell. We are not sure to whom this refers. Sidney and Violet Wilson. In 1954 the electoral roll shows that Sidney and Violet Wilson lived at 10A Chapel Street. We believe that Sidney lived in this house from at least 1938 when their son Desmond Wilson (who was born on 5th December 1938) was enrolled in the United Reformed Church in 1939 the address of the family was given as Chapel Street. The register compiled in 1939 in preparation for the war shows Sidney and Violet living there. Sidney was described as a semi-skilled fitter born on 26th October 1907. Violet was born on 9th April 1916. Desmond was the son of Sidney and Violet. The FreeBMD website for that year shows that his mother’s maiden name as Bird. Sidney Wilson married Violet Bird in Bristol in 1936. Sidney and Violet had another son, David, born in October 1940, but he only survived for two days. We know that the Wilsons lived in this property until it was sold to the Council for demolition as we have a copy of a letter dated 15th August 1958 addressed to Mr S Wilson of Chapel Street. The letter was written by the Clerk of the Council and was refusing Sidney’s request to trap rabbits on the Mundy Playing fields.